ခရီးသွားရုပ်ရှင် Thelma & Louise (၁၉၉၁) တွင် လမ်းကြုံကားလိုက်စီးသူ ကောင်းဘွိုင်အဖြစ်နှင့် ပထမဦးဆုံး သတိထားအသိအမှတ်ပြုမှု ရရှိခဲ့သည်။ ငွေကြေးအကုန်အကျခံရိုက်ကူးသောဇာတ်ကားများတွင် အဓိကသရုပ်ဆောင်အနေဖြင့် ကနဦး၌ အလွမ်းအဆွေးဇာတ်လမ်း A River Runs Through It (၁၉၉၂) နှင့် Legends of the Fall (၁၉၉၄), နှင့် ထိတ်လန့်သည်းဖိုရုပ်ရှင် Interview with the Vampire (၁၉၉၄) တို့တွင် သရုပ်ဆောင်ခဲ့သည်။ မှုခင်းဇာတ်လမ်း Seven နှင့် စိတ်ကူးယဉ်သိပ္ပံဇာတ်လမ်း 12 Monkeys (၁၉၉၅) တို့ဖြင့် ချီးကျူးမှုခံခဲ့ရရာ ဒုတိယဇာတ်လမ်းတွင် ဇာတ်ပို့သရုပ်ဆောင် အနေဖြင့် ရွှေကမ္ဘာလုံးဆု အပြင် အကယ်ဒမီဆန်ကာတင်စာရင်းဝင်ခဲ့သည်။ . ↑ ၃.၀ ၃.၁ Russell Smith။ "Brad Pitt Only Does Interesting Movie Roles"၊ Deseret News၊ October 19, 1993၊ စာ- EV6။ "It was in 1991, when he hitched his ride with Geena Davis and Susan Sarandon in Thelma & Louise, that Pitt's star began to twinkle in earnest." ↑ Linda B. Blackford (April 4, 1997). "Pitt Was Right About 'The Devil's Own'". ↑ Chris Nashawaty (July 16, 1998). 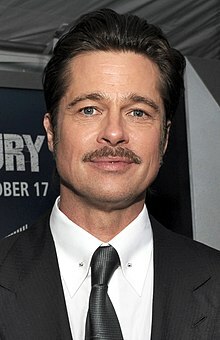 "Brad Pitt loses his teeth for a "Fight"". Entertainment Weekly. Retrieved on February 25, 2009. 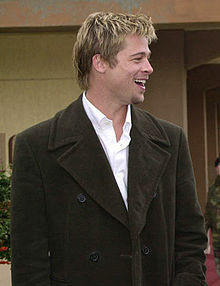 ↑ Night Monkey 2 (with Brad Pitt). Jackass (8). 22–23 minutes in. ↑ The Abduction (with Brad Pitt). Jackass (9). 22–23 minutes in. ↑ Claudia Eller။ "Academy to ponder credit for 'Departed'"၊ Los Angeles Times၊ January 24, 2007၊ စာ- 2။ November 14, 2008 တွင် ပြန်စစ်ပြီး။ "Along with [Graham] King, [Brad] Grey and his former producing partner, actor Brad Pitt, were given screen credit on the movie by Warner." ↑ "Big Lenders"၊ RedEye (Chicago Tribune)၊ May 11, 2007၊ စာ- 72။ "Refugee camps in Darfur and neighboring Chad are receiving a big dose of help from Bradgelina. Angelina Jolie and Brad Pitt are donating $1 million to humanitarian efforts there through their Jolie-Pitt Foundation ... The money ... will go to three organizations that help millions of displaced refugees in and around Darfur." ↑ "Does Jolie lead Hollywood by example? 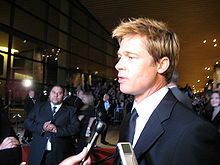 "၊ Access Hollywood၊ MSNBC၊ July 17, 2006။ November 14, 2008 တွင် ပြန်စစ်ပြီး။ "Brad Pitt—whose most recent cause has been close to home and heart—working with Global Green USA ... on a competition to choose ecologically sound designs for rebuilding neighborhoods in post-Katrina New Orleans." ↑ Robin Pogrebin။ "Brad Pitt Commissions Designs for New Orleans"၊ The New York Times၊ December 3, 2007။ November 14, 2008 တွင် ပြန်စစ်ပြီး။ "Mr. Pitt pledged to match $5 million in contributions to the project, as did Steve Bing, the philanthropist." ↑ Tauber၊ Michelle။ "Angelina Adopts a Girl: And Baby Makes Three"၊ People၊ July 18, 2005။ January 8, 2015 တွင် ပြန်စစ်ပြီး။ "As of July 6, the actress and United Nations activist was expected to have officially signed papers and obtained a passport stamp for a relatively newborn Ethiopian girl..."